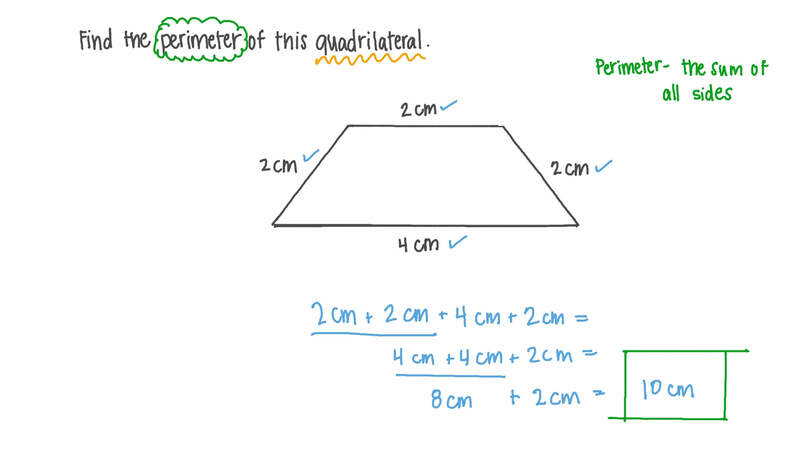 In this lesson, we will learn how to find the perimeters of different shapes. Find the perimeter of this quadrilateral. Determine the perimeter of the given figure. What is the perimeter of the shape below? 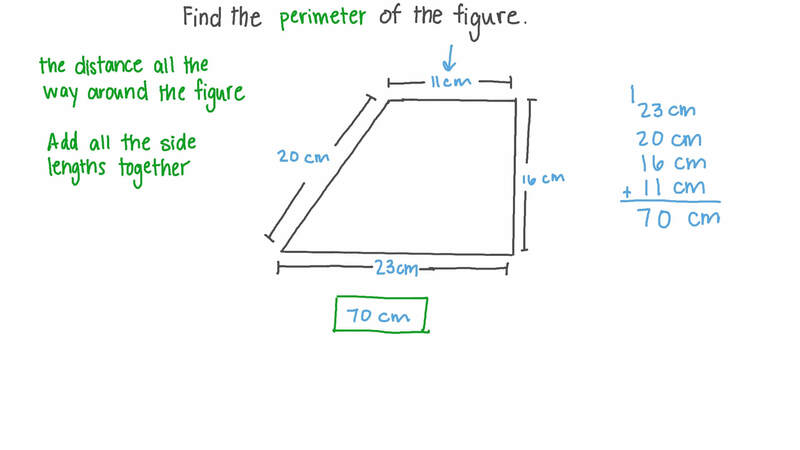 Determine the perimeter of the shown figure. Determine the perimeter of the coloured area shown. Find the perimeter of the shape. In the figure below, determine the perimeter of the shaded part, given that the side length of every small square is a unit. If the perimeter of the shown figure is 54, determine the length of the last side. If there is a square whose side length is 9 cm and a triangle whose side lengths are 24 cm each, which of the following statements is correct? AThe perimeter of the triangle is twice as long as the perimeter of the square. BThe perimeter of the triangle is equal to the perimeter of the square. 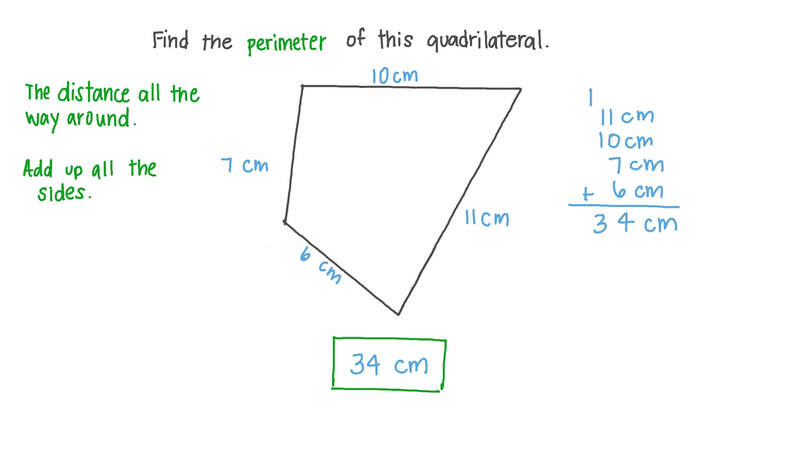 CThe difference between the perimeter of the square and the perimeter of the triangle is half their sum. DThe perimeter of the square is larger than the perimeter of the triangle. A square has side lengths of 10 cm and a triangle has sides of length 13 cm, 12 cm, and 3 cm. Which shape has the longer perimeter? Given that 𝐴 𝐵 𝐶 𝐷 is a parallelogram, determine the perimeters of 𝐴 𝐵 𝐸 𝐷 and △ 𝐷 𝐸 𝐶 . Given that the perimeter of the figure is 40 yd, determine the length of the missing side. The lengths of two sides of an octagon-shaped table are 24 feet each, and the other six sides are 8 feet each. What is the perimeter of that table? In the accompanying figure, 𝐴 𝐵 𝐶 𝐷 is a trapezium with parallel sides 𝐴 𝐷 and 𝐵 𝐶 . Let 𝑋 be the point of 𝐵 𝐶 so that 𝐴 𝐵 𝑋 𝐷 is a rectangle. What is the perimeter of △ 𝐷 𝑋 𝐶 ? What is the perimeter of the figure shown? The perimeter of a regular quadrilateral is 232. What is the length of a side? What is the side of a regular hexagon of perimeter 1 764? Which is bigger in perimeter, a square whose side length is 53 cm or an equilateral triangle whose side length is 76 cm? What is the perimeter of the following hexagon? Find the length of 𝐴 𝐵 given the total perimeter of the shape is 3 3 1 2 cm.